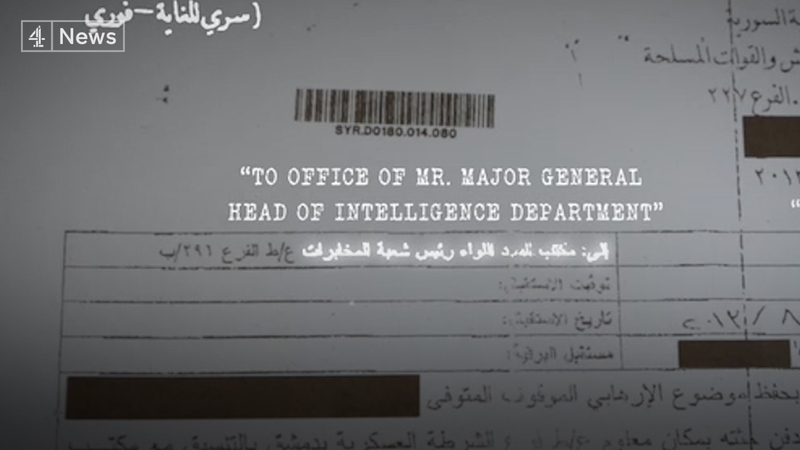 Filmmakers Sara Afshar and Nicola Cutcher reveal evidence showing the Head of Military Intelligence asked to be informed about every single death of an individual in his custody. New evidence from inside the Syrian regime shows “systematic” criminal acts. Western organisations now hope the evidence will help bring justice for families. Syria’s Military Intelligence knew that detainees were being tortured and the numbers dying were rising, new documents reveal. The evidence, seen by Channel 4 News, is drawn from the regime’s own internal records which have been smuggled out of Syria and analysed by war crimes investigators at a secret location in Europe. It shows that the Syria’s Head of Military Intelligence asked to be informed about every single death of an individual in his custody. War crimes investigators say the paperwork is evidence against the Syrian leadership and could be the key to justice for the families of the disappeared. 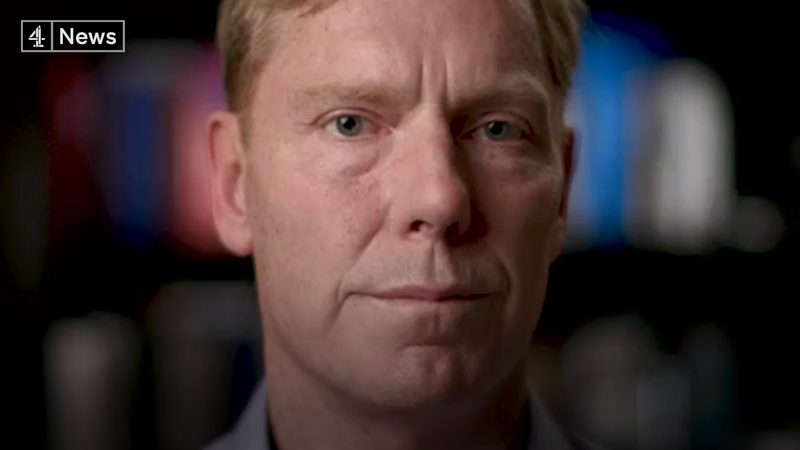 Bill Wiley, Head of the Commission for International Justice and Accountability, a private non-profit organisation, funded by Western governments, told Channel 4 News they’ve uncovered vital new evidence against the leadership of Syria’s Military Intelligence. They have uncovered regime documents providing details that match with corpses pictured in the so-called “Caesar photographs”, which were smuggled out of the country by a defector – and show bodies of over 6,700 people who died in regime custody. 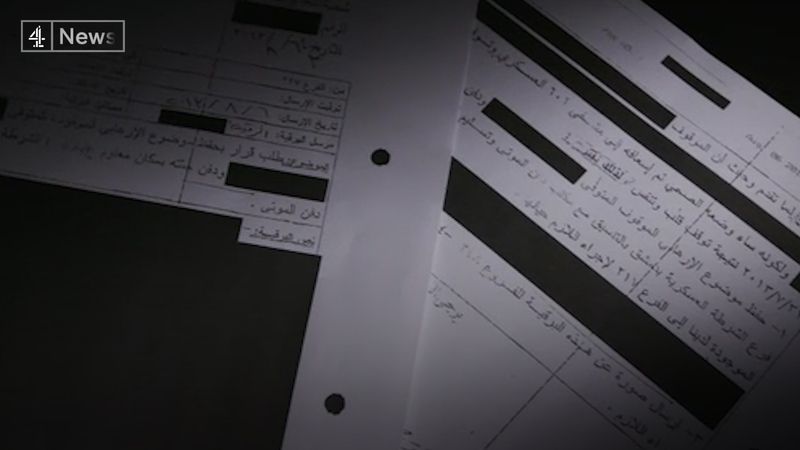 Shown exclusively to Channel 4 News, the documents reveal it was known that detainees were being tortured and the numbers dying were rising. The evidence obtained by investigators comes from the Military Intelligence’s own internal communications and reveals the Head of Syria’s Military Intelligence asked to be informed about every detainee death and even consulted on what to do with some corpses. Perhaps the most significant piece of evidence which investigators shared with Channel 4 News is a death report which can be matched with a corpse pictured in the Caesar photographs. The document addressed to the Head of Military Intelligence, alleges that the detainee was a terrorist – a broad definition the regime often uses for anyone who opposes it. The investigators cross-checked the detainee’s number with the Caesar photographs, and found corpse number 2668 from Security Branch 227 – a man who appears to have had his eye gouged out. The document is signed by the Head of Security Branch 227, where more than 2,000 of the detainees whose bodies appear in the Caesar photographs were held. Channel 4 News has seen several more of these signed death reports, and their matching Caesar photographs. Last year, when President Assad was questioned about the Caesar photographs in an interview by Yahoo! News, he said: “Who verified the pictures? Who verified that they’re not edited and PhotoShopped and so on? Channel 4 News asked the Syrian government for a response to the allegations in this report but they have not responded.